On behalf of the Tobyhanna Creek/Tunkhannock Creek Watershed Association (TC/TCWA), I welcome you to our website. TC/TCWA is a non-profit corporation founded in 1991 with the mission of preserving the quality and integrity of the waters, lands, and wildlife within our 125-square-mile watershed for the benefit of all. Located in the headwaters of Pennsylvania’s Lehigh River, our watershed contains wetlands and other habitats with such unusual diversity and limited human impact that The Nature Conservancy has classified the region as one of the "Last Great Places" on earth. 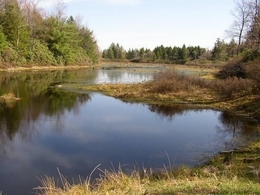 While the quality of all waters within Pennsylvania is protected to some degree, we are very fortunate to have waters that are presently classified as either High Quality or Exceptional Value by the Pennsylvania Department of Environmental Protection and are provided with an extra measure of legal protection. However, vigilance is necessary to ensure that the needs of regional growth are balanced with preserving the specialness of our waters, as once degraded they cannot be easily restored. TC/TCWA is committed to maintaining this vigilance. We all need and use water which means we have a responsibility to be good stewards of it. After all, everyone lives upstream or downstream from somebody. We welcome any and all to support and/or participate in our organization; the public is welcome to attend our monthly Board meetings held at The Nature Conservancy’s Hauser Nature Center on Long Pond Road (e-mail tctcwa@hotmail.com to request exact dates and times).